It seems it is quite hard to be Bilingual. And I have first-hand experience with this since I can speak fluent English and Urdu. However, people usually don’t expect you to speak two languages and think they can trash talk you right in front of your face. Well, this one woman had another thing coming. You see a customer thought it was a good idea to trash talk a cashier in front of her face. 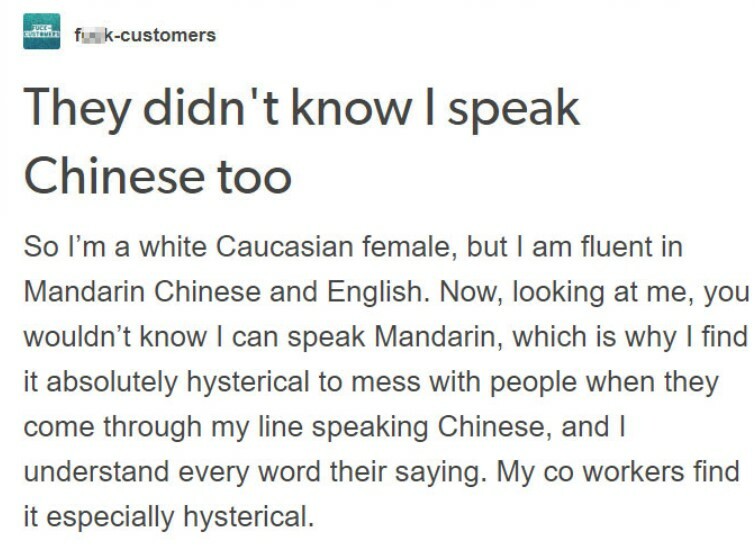 After all, the cashier didn’t know this incredibly hard to learn language right? That is where she was wrong. Not only did the cashier understand everything, she decided to keep quiet until the very last moment. Scroll down below and take a look. The saying “Don’t judge a book by its cover” fits quite perfectly here. I can see why it would be quite hilarious. You must have some great moments to talk about. That does sound like ‘fun stuff’. I used to hear that comment on my hair all the time when it was quite short. Why does anyone care what we look like? I am just sad that people like this still exist. Following is what people had to say about this whole ordeal. Just being bilingual doesn’t mean a good job is guaranteed. Must she have told them afterwards right? Not a great reason but learning more than one language is awesome. Has this ever happened to you? Comment down below and let us know.